Mowing sports turf is one of our core services. We possess a wide range of mowing equipment and can maintain every surface from tennis courts through to golf courses and sports fields. Mowing has been at the heart of Turfcare WA’s operations since the company’s inception over 35 years ago. Growing from walk-behind cylinder mowers used on tennis courts, we now possess a wide range of ride-on cylinder and slasher mowers as well as trailing cylinder and flail units. Our fleet of fairway, greens, tees and rough mowers currently ensure that several golf courses are maintained and presented to tournament standard. Five and seven gang cylinder mowers, flail unit configurations, and out front mowers ensure that any sports field can be maintained efficiently without impacting user groups. 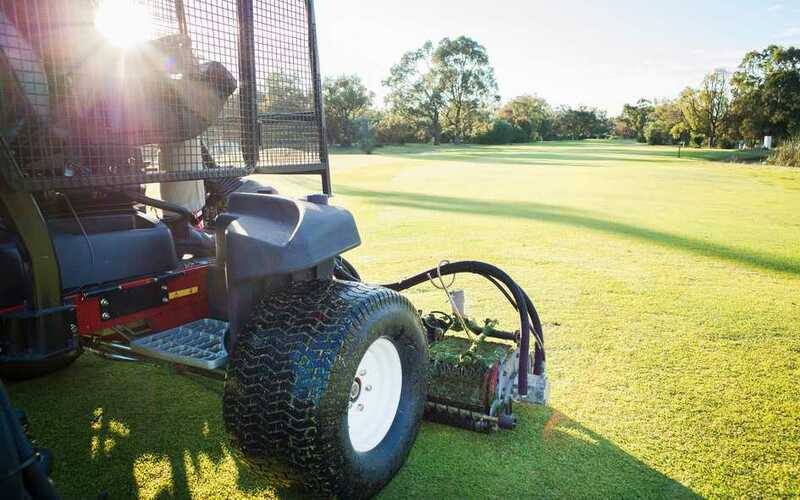 For smaller areas like tennis courts and cricket wickets, we possess a range of walk-behind, greens and triplex mowers that are fit for purpose to your maintenance requirements. We combine these machines with experienced and qualified turf professionals to achieve the highest quality finishes. Our team is ready to help you with expert advice and ongoing support for your turf maintenance needs. We can offer mowing as a stand-alone service, or we can combine our resources into a custom-designed service package to suit you and your facility.